If you travel to Moscow you can book a day to take a trip to one of the cities of the Golden Ring of Russia, such as Suzdal or Sergiyev Posad, as you will discover the contrast between the great city that is Moscow and the more rural Russia with churches, Kremlins and monasteries, some of them declared World Heritage by UNESCO. If you have extra time to spend in Moscow, you can spend up to a week to tour all the cities of the Golden Ring. The first of them is the route that runs through the two main cities of the country: Moscow and St. Petersburg. The second route is the one that crosses the Transiberian and that crosses the country from part to part by train, throughout Siberia. 1. What is the Golden Ring of Russia? The Golden Ring of Russia is an itinerary that runs along a series of cities of tourist interest, located on the northeast of Moscow, in which there are a set of medieval towns with monasteries, churches, cathedrals and kremlins, that collect around a thousand years of Russian Orthodox history. Important poets, writers and musicians lived in one of these cities, located in the five oblast or regions of the Federal District of Central Russia: Ivanovo, Kostroma, Vladimir, Yaroslavl and the Moscow region. Some of these cities are located near Moscow and are a good place to make a 1 day getaway to more rural Russia. Other cities are further away and its visit requires more time (spend the night or a weekend). By visiting the cities of the Golden Ring you will discover the most rural and remote part of Russia, away from the great city that is Moscow, as well as spectacular kremlins, churches and monasteries, some of them declared as World Heritage Site by UNESCO. But visiting all the cities of the Golden Ring can take a week. If you want to make a route that begins and finishes in Moscow and that travels the main cities of the Golden Ring, then the route that you have to do is about 700 kilometers. 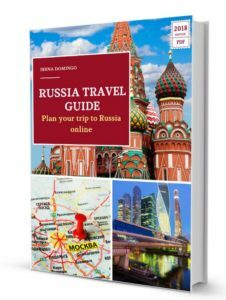 You should take into account that the main tourist attraction of this route are the churches, monasteries, icons and kremlins, so if this is a subject that you like you will enjoy visiting the different cities; however, if this isn’t your topic, it’s easy to be overwhelmed by these monuments with a view of a couple of cities. There is no official list of all the cities included in that route, with the exception of the 8 main cities: Sergiyev Posad, Rostov Veliky, Pereslavl-Zalessky, Yaroslavl, Kostroma, Ivanovo, Vladimir and Suzdal. Sergiyev Posad (75 kilometers from Moscow). A city of about 110,000 inhabitants. It is the only city in the Moscow region that is part of the Golden Ring. Its proximity to Moscow and its Monastery of the Trinity and St. Sergius (spiritual center of the Russian Orthodox Church and declared a World Heritage Site by UNESCO). This city is an ideal place to make a 1 day stop (below I’ll explain how). Pereslavl-Zalessky. (144 kilometers). A city of about 40,000 inhabitants, known for its rich architectural heritage, among which stands out the old cathedral of the Transfiguration of the Savior in white stone (now a museum), the Metropolitan church of Peter and the monasteries of Troitse-Danilov, Nikitsi, Feodorovsky and Goritsy. Rostov Veliky (207 kilometers). A city of about 30,000 inhabitants, whose official name is Rostov, but in Russia it is known as Rostov Veliky to distinguish it from Rostov-on-Don (a city with more than 1 million inhabitants). It has the most beautiful kremlin of the entire tourist route of the Golden Ring. By train you can reach in 2 hours and a half (the train station of this city called Rostov Yaroslavsky). Yaroslavl (264 km). A city of more than 600,000 inhabitants which is considered as the capital of the Golden Ring and located on the banks of the Volga River. It is famous for its numerous and beautiful churches. It is a good place to do a weekend excursion, combining the visit with the city of Rostov Veliky, since the city is very well connected with Moscow. Kostroma (340 kilometers). The most remote city of Moscow from the Golden Ring, located at the confluence of the Volga and Kostroma rivers, with a population of about 270,000. It is considered the cradle of the house of the Romanovs. Within the monuments of the city you can find the Ipatievsky Monastery in which the Dormition Cathedral the stands out. Ivanovo (300 km). With a population of about 420,000 inhabitants, it is the administrative center of the region of the same name. It has been traditionally called the textile capital of Russia or also the “City of Brides” given the number of women working in factories. It is not a city with as many tourist attractions as others of the Golden Ring but you can combine your visit with Plyos. Suzdal (220 kilometers). With 10,000 inhabitants, it still retains its rural charm and it’s perhaps the most fascinating city of all the Golden Ring. 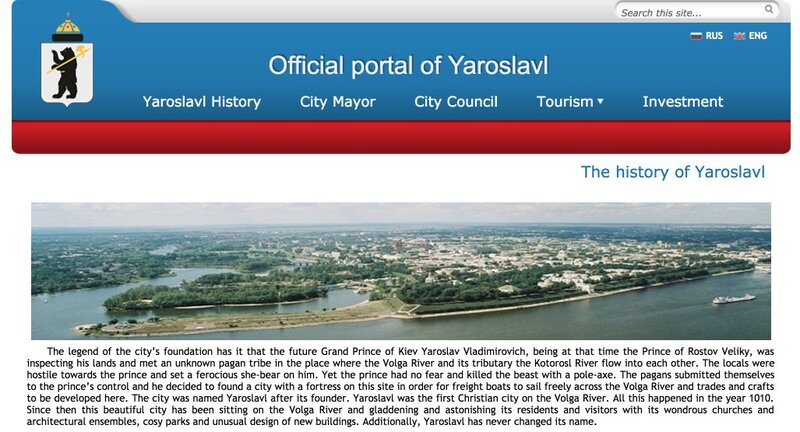 Its proximity to Vladimir makes many tourists to do a combined visit to both cities. It is like an open air museum, given the amount of old and beautiful buildings that can be seen. Some of its places are declared as World Heritage by UNESCO, such as the White Monuments of Vladimir and Suzdal, a set that is comprised of eight medieval monuments of limestone of Zalesye. There are also several monasteries and museums of the Kremlin. Visiting in a single day can be a bit troublesome since Suzdal doesn’t have a train station and you have to combine train and bus or taxi (via Vladimir) to get there, so it is advisable to spend the night in the city to do a more relaxed visit (I will explain below). Vladimir (180 kilometers). A city of about 340,000 inhabitants, including the Uspensky Cathedral (from Dormition), the Cathedral of St. Demetrius (1194-1197), the Golden Gate, an ancient city gate, and several ancient monasteries. A beautiful city whose visit can be combined with that of Suzdal. Many of the cities are connected by rail with Moscow, but other cities only have a road connection by bus, which makes them more virgins in terms of tourism and less affected by the process of Soviet industrialization. Keep in mind that, though the connections are good, buses are not always very comfortable. Also you have to consider that in order to visit some of the cities you can lose enough time so in some of them it is advisable to spend the night in some accommodation. 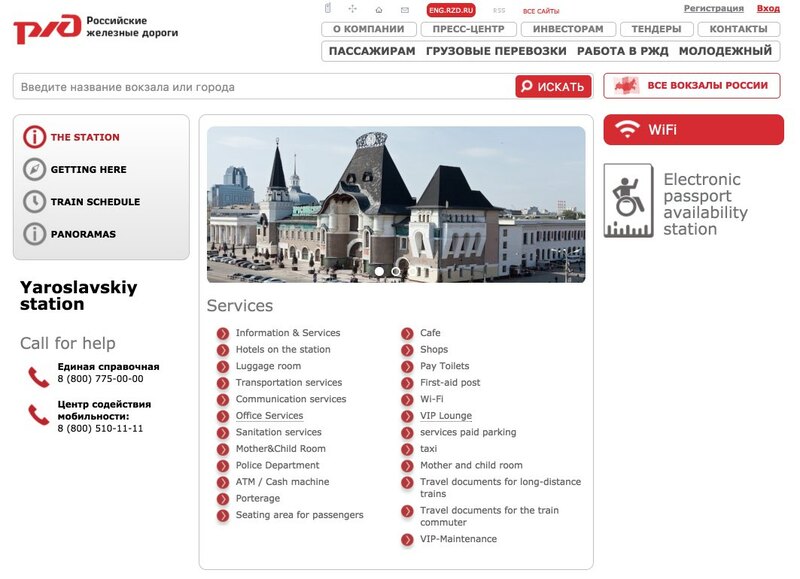 In addition to the railway and the bus, you can also visit the Golden Ring by taking a taxi, renting a car in Moscow or arranging an organized tour with a tourist agency or a private tour. I will explain below how. The lodging offers along the route are very abundant and varied, since many tourists make the trip. 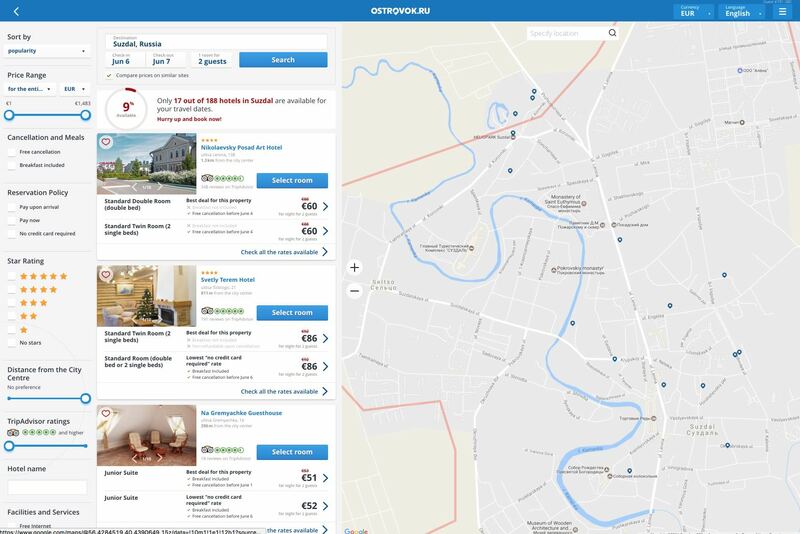 However, there are no 5 star luxury hotels, but it is possible to book 4 star hotels at a good price (for about $ 50 you have a double room in a 4 star hotel in Suzdal), or cheap hostels. In the smaller cities, the hotel offer is smaller and in some of them it is possible to find only smaller hotels of Soviet style, though the hotel offer is increasing. 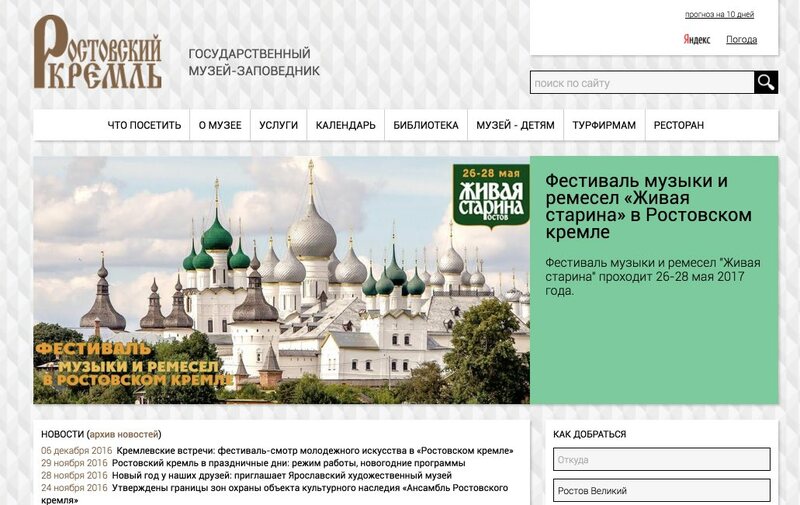 In any case, most hotels can be booked online through the Russian reservation platform Ostrovok or with Booking. The restaurants offer is also wider in the larger cities, though it is usually traditional Russian food establishments and not so much elaborate cuisine. All the cities of the Golden Ring are very interesting to visit and have a quite similar architecture. However, since you don’t always have enough time to see them all, it is wise to make a selection. This will depend on whether you have 1 day or several days available. Perhaps the most fascinating city of all is Suzdal, near Vladimir, which is why many tourists make a combined visit of both cities, though Sergiyev Posad is also worth seeing, with the advantage that it is the closest to Moscow (only 75 kilometers away). 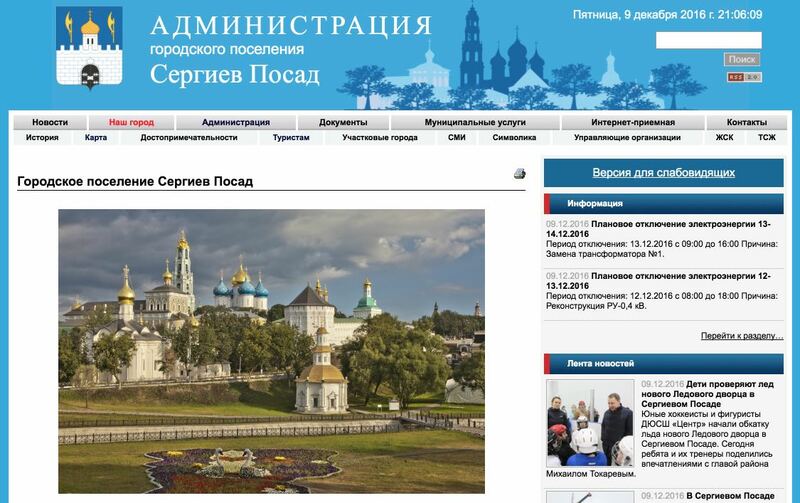 Sergiyev Posad. The nearest city to Moscow, to which you can arrive to in 1 hour and a half. It takes around 3 hours of travel a day approximately (round trip), a reasonable time to visit the city in 1 day and return to Moscow. 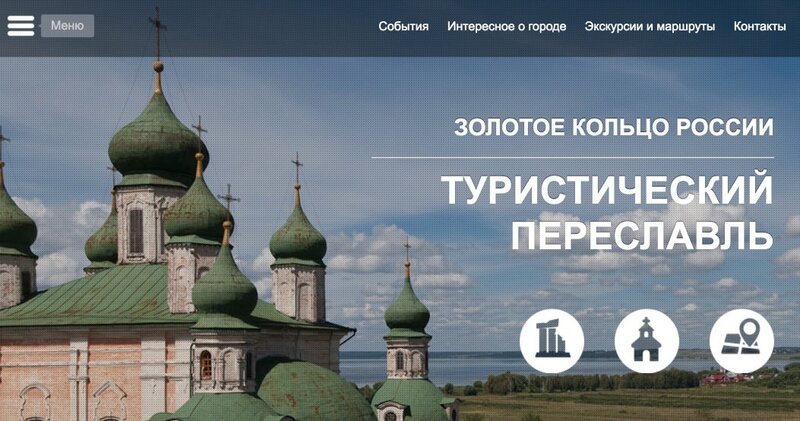 Suzdal. Depending on the means of transport used to reach Suzdal, it may take more than 4 hours and returning to Moscow can take another 4 hours, so doing this visit can be a bit heavy if done in 1 day only (it requires getting up early, returning late and many hours of travel). It is recommended that you spend the night on an accommodation if you prefer a more relaxed visit, though there are many tourists who visit the same day (who are also visiting Vladimir). Later I will explain which is the fastest way to arrive in about 3 hours if you want to visit in 1 day. Sergiyev Posad, a city of about 110,000 inhabitants, is located at the north of Moscow, and it’s the most popular destination in the Golden Ring for a day trip, due to its proximity to Moscow and the number of trains and buses that connect directly with the city. Its Monastery of the Trinity and San Sergio is a World Heritage Site by UNESCO and it is one of the most sacred places of Russia since the Orthodox monks still inhabit it. Some call it the “Russian Vatican.” The monastery is located 1 kilometer from the train station and can be reached by walking, around 20 minutes. During the route from Moscow to Sergiyev Posad you can appreciate the Russian dachas, which are the weekend houses of the Muscovites. You can get to Sergiyev Posad in several ways: by train, bus, taxi or private tour. The fastest way to get to Sergiyev Posad is by train, since you will avoid any traffic jams that occur on the way out of Moscow. There are several trains that make the journey and all can be taken in Yaroslavsky Station, located in Komsomólskaya Square (where is the Metro station with the same name). In the surroundings of this station there are also two other train stations that should not be confused: Leningradsky and Kazansky. Express train. The fastest way to get to Sergiyev Posad is taking an express train that goes to Aleksandrov and it takes a little more than 1 hour to reach Sergiyev Posad. This train only stops at Sergiyev Posad and you have to pay attention since the stop is only 1 minute. These trains don’t transit frequently (around 4 a day). The first leaves from Moscow at 9:20 and the last train is back at 16:00. 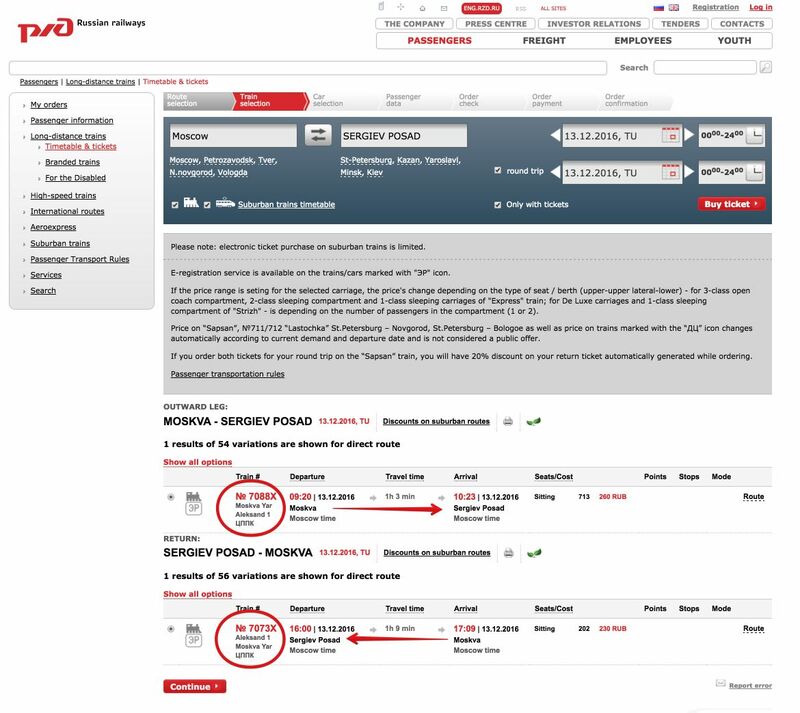 However, the schedules can be variable depending on the time of year, so it is best to consult them on RZD’s own website. These tickets can be purchased online (10 days in advance) and also at the station itself. 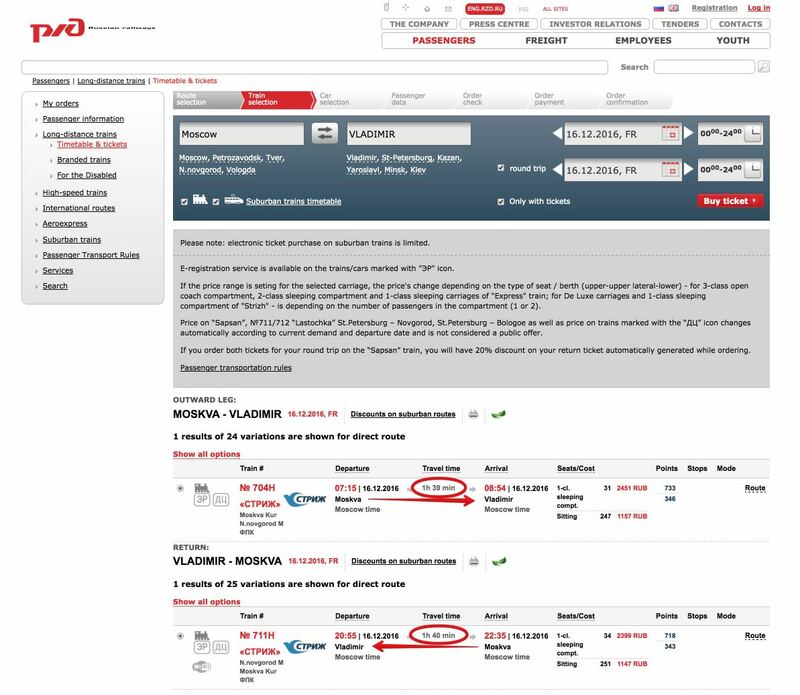 The return ticket costs 490 rubles on RZD’s website (the one-way ticket costs only 260 rubles). The Suburban train. There is also a slower suburban train, with many stops (where street vendors get on at the stops) and it takes 1 hour and a half long. Every 15-30 minutes there is a suburban train that runs this route, depending on the time zone. Tickets have to be bought at the same ticket office at the station. There are no ticket availability issues (it’s like buying a ticket for a commuter train). Prices are even more economical and suburban trains leave Moscow, starting at 5 am, very often, and return from Sergiyev Posad to Moscow until 22:47 p.m.
You can combine both trains: for example, go to Sergiyev Posad with the express and then return with the suburban train. It is also possible to reach Sergiyev Posad through bus number 388, which is taken next to the VDNKh metro station. This bus leaves every 15-20 minutes and takes 1 hour and a quarter to arrive (as long as there is no traffic). Buses run to the Sergiev Posad station, located next to the train station. 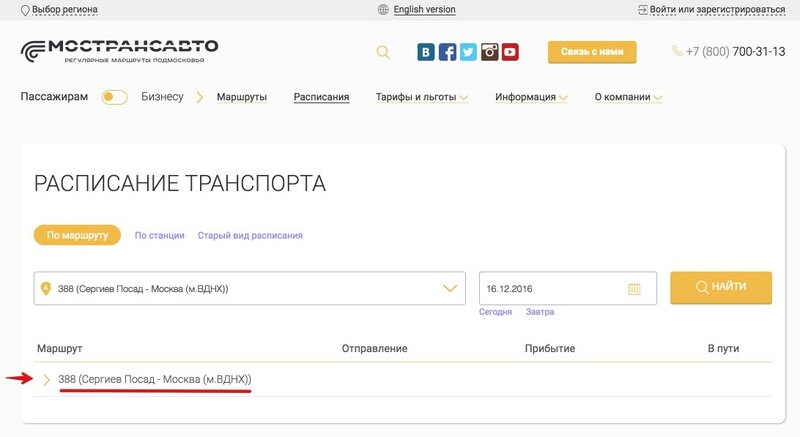 Bus tickets can be purchased on the Mostransavto website, but the website is only in Russian, so it is best to buy tickets on the same day, as there are no ticket availability problems. Another option is to take a taxi. 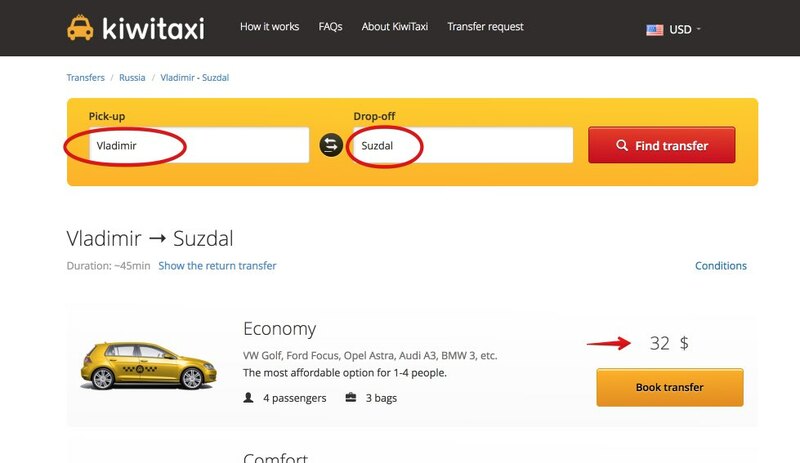 A one-way trip from Moscow to Sergiyev Posad by taxi with KiwiTaxi company costs $48 (for 4 passengers). The advantage of this option is that you can book online and the taxi picks you up at the hotel at the agreed time and you don’t have to go to any train or bus station. The downside is that it is more expensive and you can catch some traffic jam, anyways. You can also book the return at the same time, or make the return by another means of transport. There are also companies that offer private tours by car, among which I would definitely recommend Lingotaxi. 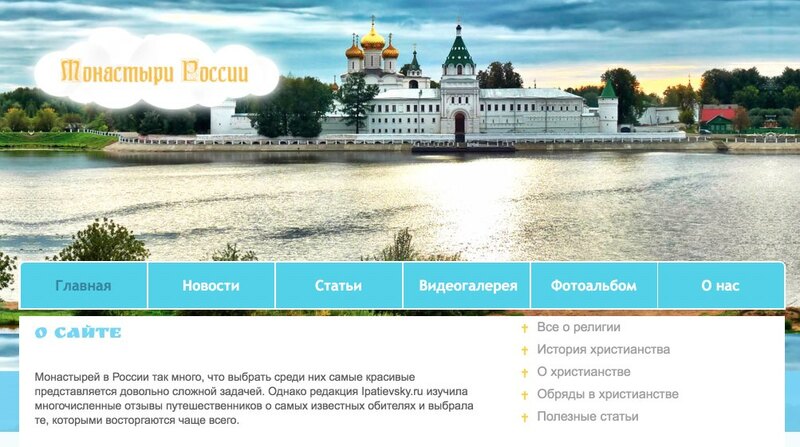 With this company you can hire a full day tour to visit Sergiyev Posad by car with driver and a English speaking guide for 9,900 rubles for 4 passengers, or 14,900 rubles for 7 passengers. They pick you up at your hotel and at the end of the day they give you the ride back. 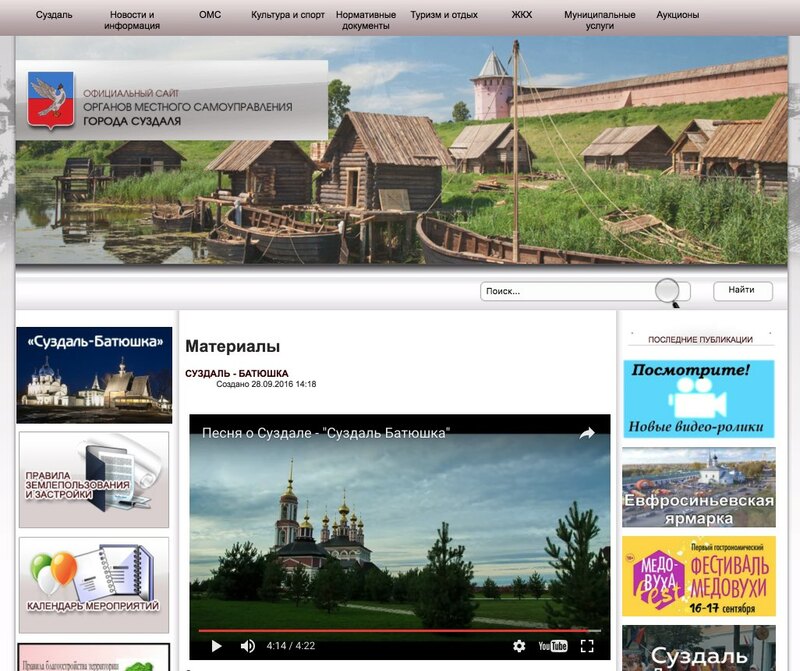 As you can see in the screenshot, you can also hire a tour to visit Suzdal and Vladimir. Suzdal is another popular destination of the Golden Ring and it truly is like an open air museum, given the amount of old and beautiful buildings that can be seen. The city has a population of about 10,000 inhabitants. Some of its places are declared as a World Heritage Site by UNESCO, such as the White Monuments of Vladimir and Suzdal. There are also several monasteries and Kremlin museums. The visit to Suzdal can be combined with a visit to Vladímir, also an interesting city if you have time, but you can visit it more quickly than Suzdal. Unlike Vladimir, Suzdal does not have a railway station and it has practically no industry, which is why it still retains its rural charm. Getting to Suzdal, 220 km from Moscow, is not as easy or quick to get as Sergiyev Posad, but it is a city worth visiting for the huge contrast of going from Moscow to this charming rural town. The good thing is that it is a small town and the tourist attractions are very close to each other. The nearest train station to Suzdal is Vladimir, a town around 35 kilometers from Suzdal. This way you can go by train to Vladimir and from there you can take another type of transport (bus or taxi). Trains depart from Kurskiy station in Moscow. Strizh. The fastest of all (takes 1 hour and 39 minutes) but also the most expensive (an armchair ticket costs between 1,000 and 3,000 rubles, depending on the train and the time of year). It departs at morning at 7:15 am. 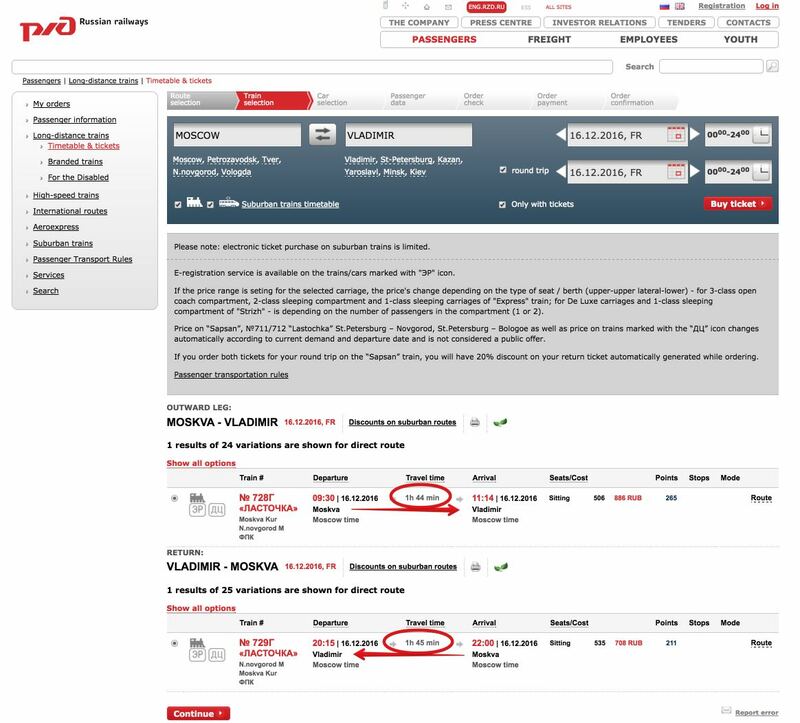 and 11:00 am, in the afternoon the last trains heading to of Moscow leave at 8:55 pm and 10:17pm (it is best to consult on RZD’s website since schedules can vary). Lastochka. It takes about 1 hour and 45 minutes and is a bit more economical than the Strizh. For the departure there is a train at 9:30am (a fairly reasonable hour) and for the return, the last train leaves at 8:15pm. Both trains can be combined, make the departure with one and return with another. There are also cheaper suburban trains that do the route, but some can take more than 3 hours. Once you have reached Vladimir, you have to take another transport to get to Suzdal. As soon as you leave Vladimir station and cross the road, you will arrive at the bus station where you can take a bus to Suzdal (about 35 km from Vladimir). These buses usually leave with a frequency of 30 minutes or 1 hour and take about 45 minutes to reach Suzdal. 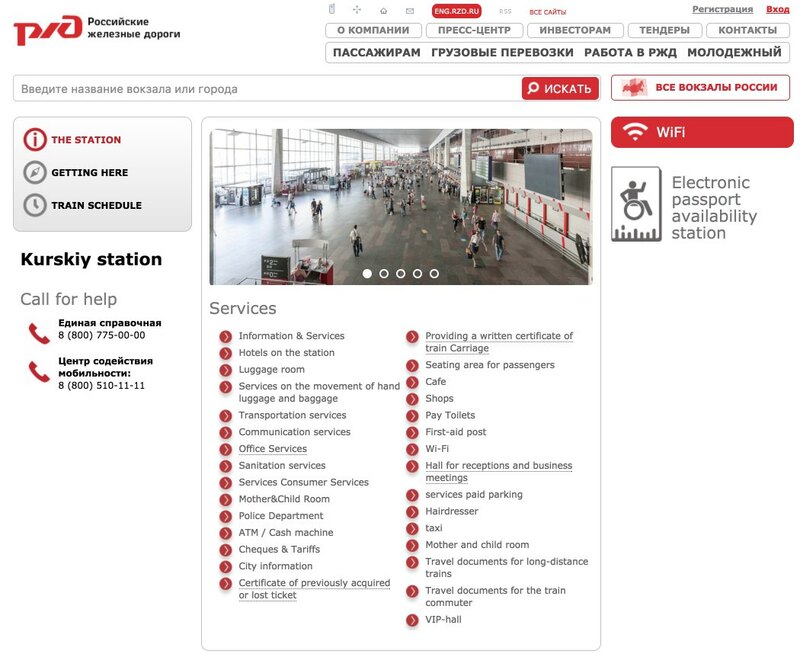 Tickets can be purchased online at http://www.biletnaavto.ru, but the site is only in Russian, so it is best to buy the tickets at the same station (tickets are always available). Tickets are economic, less than 100 rubles per person. If you are a group, a faster and more comfortable option is to book in advance a taxi from Vladimir to Suzdal, specifying the time at which the train will arrive to Vladímir, so that the taxi will be waiting for you. With KiwiTaxi it costs about $32 for 4 people. You can go directly by bus from the Schyolkovsky bus terminal, but the bus ride can take about 4 and a half hour depending on traffic. These buses also stop at Vladimir. This option is not recommended unless you are in a hurry and you are look for cheaper transportation. The direct taxi ride from Moscow to Suzdal can also take around 4 hours. In short, if you take a high-speed train and then combine it with a taxi, you can reach Suzdal in less than three hours, a reasonable time to visit the city and return to Moscow the same day. However, if you take a slower transport or simply you want to make a more relaxed visit, and also have the time to visit Vladimir or Bogolyubovo (another interesting visit near Vladimir), then it is best to spend the night in a Suzdal accommodation. If you have more time, then it is worth making a longer route, either a weekend or an entire week-long route to tour the main cities of the Russian Gold Ring. 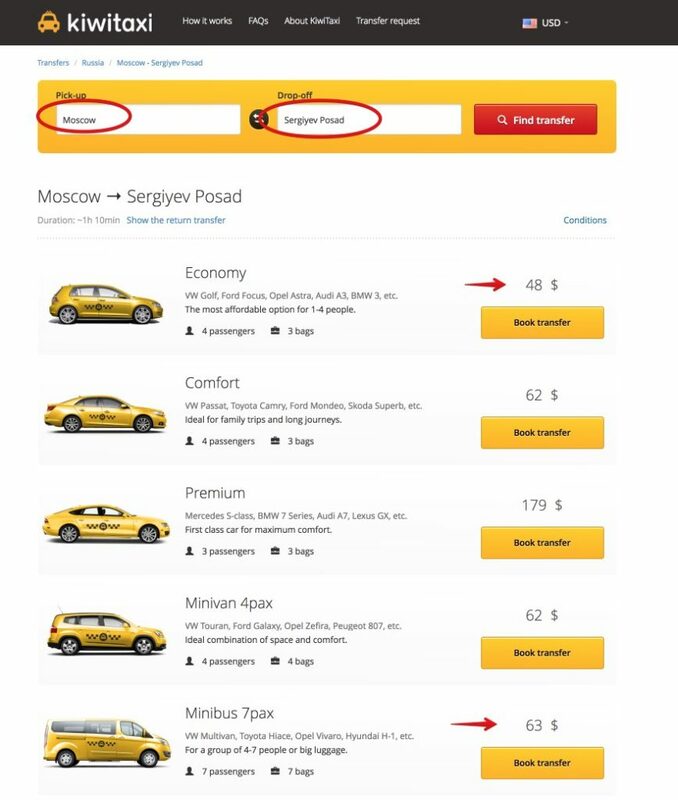 You can do this by taking public transport, but you can also do it by renting a car in Moscow as there are many car rental companies in the city: Avis, Hertz, Sixt or the local Biracs. There are also many tourist agencies that organize trips along this route. The whole route can be done clockwise or counter-clockwise, following the course of the Volga River and visiting the cities of Sergiyev Posad, Pereslavl-Zalessky, Rostov Veliky, Yaroslavl, Kostroma, Ivanovo, Suzdal and Vladimir, though the possibilities of this route and the combinations are very diverse. I hope this article has helped you organize your visit to the Golden Ring of Russia. You can tell me your experience below.